This is an absolutely unusual set of five approximately 0.25” deep red-orange crystals (one larger) of garnet from Nara, Japan, weighing 3.04 grams. These aren’t your usual garnet shape as deep keys on their sides (which make great fingertip places) distort them, although they have normal looking sides as well. Now, when I was photographing each, I noticed flashes of color, mostly in the violet, gold and green ranges. 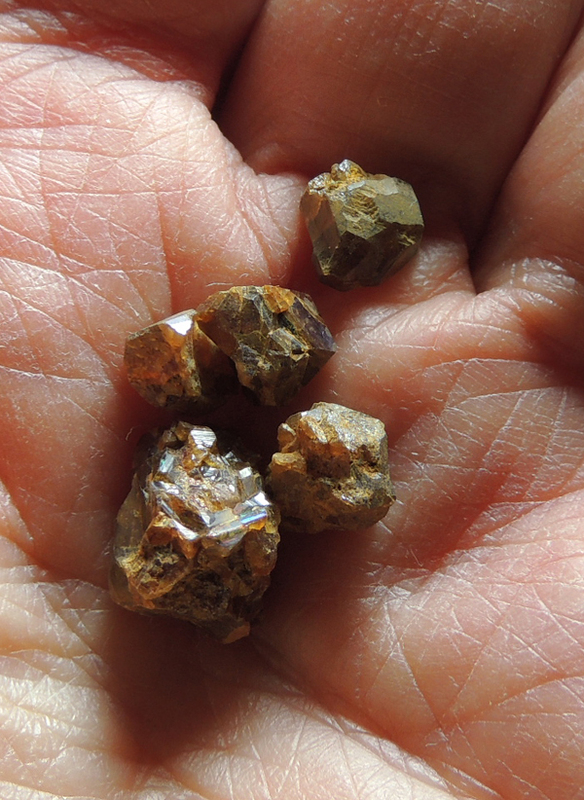 I found references to these garnets being iridescent (a surface phenomena), but this color is below the surface and like opals – they are chatoyant and fiery … so full in fact that I’m calling them ‘fire garnets’! The faces are soft gradients … I’ve never seen anything like this and believe me when I say, the camera caught only a small portion of the color flashes and given the size of these, it was very difficult to photograph them! Use a loupe so that you can properly see the exquisite expressions of these wonderfully beautiful and energetic Spirits! These are wonderful pocket talismans, especially for women. Women, in particular, tend to ‘hide their light’ and don’t speak out, don’t comment, don’t react until they are beyond the breaking point. It doesn’t mean that they don’t have contributions, but rather that they lack that central courage and passion – in many women, and usually those over 45, it is a learned behavior – we were taught not to speak out, to be subdued and demure and to be cooperative. Now, don’t get me wrong – these aren’t bad traits, but anything taken to extreme becomes a fault. These Spirits are wonderful for allowing you to express that passion again – to say and do what is truly in your heart because it is right and it is what you believe. Use them in grids with rose quartz (to promote Self love) and they will awaken the passion that is rightfully yours so that you can display that magnificent rainbow of brilliant colors that is you!